San Diego Food Handler Cards are valid for 3 years. Please Note: California Food Handler Cards are not valid in the County of San Diego. Who needs a San Diego Food Handlers Card? All Food Handlers working at permitted food establishments in San Diego County must complete a food safety training program from an approved provider to obtain a San Diego Food Handlers Card. A food handler is any person employed by a permitted food business who is involved in the preparation, storage, service, or handling of food, including those employees whose duties are limited to scooping ice, washing dishes or handling utensils. How long is my food handler card valid for? Your San Diego Food Handler Card will be valid for 3 years. How can I renew a San Diego Food Handler Card that has already expired? To renew your Food Handlers Card, you must successfully complete a food safety training program and final exam from an approved provider, such as Premier Food Safety. When do I get my San Diego Food Handler Card? You will be able to download and print a certificate of completion and San Diego Food Handlers Card as soon as you complete the online training and pass the final exam with a minimum score of 80%. I have a California Food Handler Card. Is that considered a valid San Diego Food Handler Card? No. 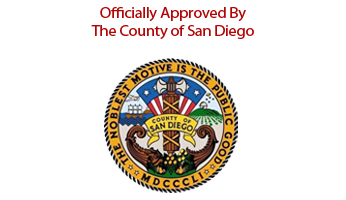 San Diego County has its own food safety training requirements for food handlers. If you work for a restaurant in San Diego, you must obtain a San Diego Food Handlers Card from a training provider approved by the San Diego County Department of Environmental Health, such as Premier Food Safety. What if I change jobs? Is my San Diego Food Handler transferrable to the new employer? As long as you continue to work at a food service establishment located in San Diego County, your food handlers card will be valid.